I celebrated the weekend of the Fourth of July hiking West Virginia’s Blue Ridge mountains at Shenandoah National Park with my family. We did a steep section of the Appalachian Trail (AT) starting from the 37.9 mile marker to the historic Corbin Cabin Cut-off–> Nicholson Hollow Trail–> Corbin Mountain Trail–>Indian Run Trail–>Corbin Cabin Cut-off–>37.9 mile marker. All in all, in our 9.5 mi hike we took in two 1000 ft. elevations, going up and down each time, each occurring within a mile. We saw bear paws and a deer. We were the only hikers on the Corbin Mountain and Indian Run trails and had no internet or phone service through the many tricky and steep portions of the trail during the 6 hours we were out in the forest. 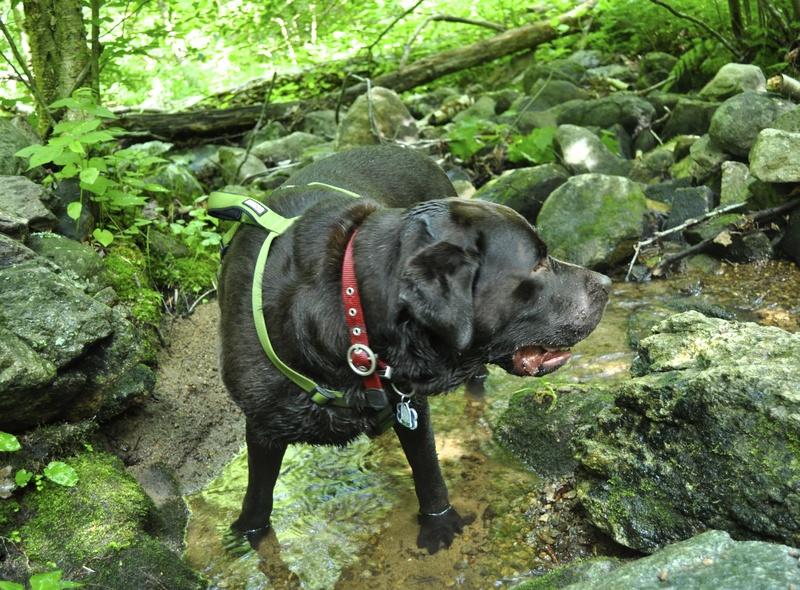 My 4-year-old lab was a trooper, although he is still sleepy two days after the 9.5 mi hike. Here he is dipping into one of the many water points provided by the Hughes River. At several points during the hike it occurred to me it would be good to have a local park app that could call for help during the long hours when there was no connectivity or service for our smartphones. Similar to Yelp, I would have loved to have a “Shenandoah” app along a dedicated community wisdom to draw upon. Social media can be usefully deployed by national parks to avoid disasters especially in areas where search and rescue operations are routinely carried out such as at the Old Rag Mountain in Shenandoah National Park. A recent example is similar to this is the tragic 19 elite firefighters’ deaths in Arizona. At such times, calling for help under unexpected situations when there is no internet connectivity could be invaluable. While there are some apps that allow for prediction and aid decision-making during disasters (see here for a NYTimes coverage), these do not yet allow for a social element for assistance nor do they tap into a crowdsourcing facility in a systematic way. Crowdsourcing can help through being able to reach out to other campers or hikers on nearby trails, for example, and would have been neat for us to have this weekend. Luckily, of course, we did not need it. It can also be great for hikers to build a shared knowledge base through their experiences during the hike. From another public relations perspective, organizations can also utilize crowdsourcing for knowledge sharing or during crises. While much has been written on the power of social networks to get feedback, connect, build relationships, and engage people, innovation has been discussed in terms of interaction and building on shared ideas. Can there be a way of systematically identifying unusual or outlier ideas that may not fall in the mainstream discussion but point to unique insights?